Wearing false nails is a new experience for me. Although I have worn them before, it has been about 2 years since the last time. I was in Primark a few days ago and thought that I'd just try them out to see if I like them or not. I've only tried this packet but I did buy another one in a dusty pink colour. With these, you can tell that they are fake because the design is very complicated. So that's why it's nice to have a range of designs and colours so that you can buy more subtle ones. First off, there are 24 nails in the pack. Initially, I thought that it was a strange number - why don't you just have 20? However, this gives you more options on the size of the nail. They are a lot longer than my nails so it does make life a little tricker during everyday activities. In terms of staying power, during the time that I have worn them, I have had two that have fallen off but I just glued them on again. In my opinion, it's interesting the way you take these off. You have to soak them in nail polish remover and they disintegrate - a clever concept. In contrast, some may argue that you can't use them again after this; true, but for £1 it's not expensive to repurchase and in some cases, you could just wait for them to fall off and reuse. 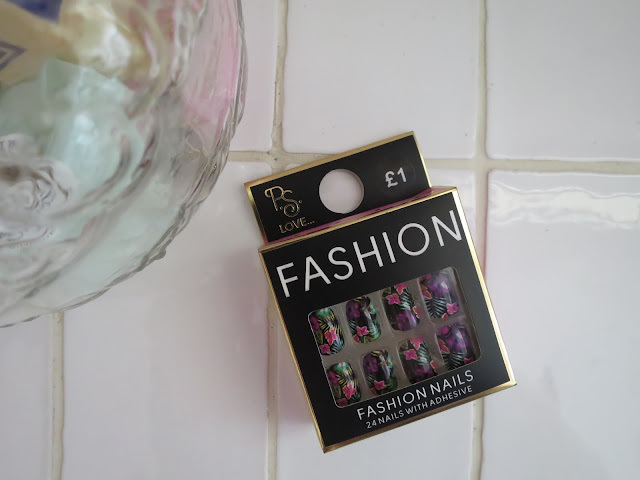 Overall, I really like these false nails and I think that they are a good value for money. Personally, I won't be wearing these on a day-to-day basis throughout the year but I will wear them for special occasions or in the summer time. Do you wear false nails? What is your opinion on them? This looks like a really simple and cheap way to jazz up your nails - looks like I'll be popping to Primark haha. CTGT: My London trip + haul!